We’d love your help. Let us know what’s wrong with this preview of Prom-Wrecked by T.H. Hernandez. When the principal announces prom is canceled this year, senior Riley Hart is determined to save it. Armed with little more than her own enthusiasm, she ends up working closely with Owen Locklear, who is more than completely off-limits. Because he’s the boyfriend of her ex-BFF, Catherine Reed. Still, Owen knows Riley better than almost anyone, and his charming ideas for turning the prom upside-down and backward win Riley over. To ask other readers questions about Prom-Wrecked, please sign up. I'll be honest, I mostly requested this book off of NetGalley out of boredom. I didn’t know if I’d like it much but thought it sounded mildly amusing, so when I found myself genuinely enjoying it, I was pleasantly surprised. Prom-Wrecked doesn’t have a lot to say – it tries in a few instances to send a message, but it’s actually far better at doing so when it doesn’t appear to be trying – but it’s fun, sort of like the book equivalent of a rom-com. All of the characters are quite lovable and real (save the villain, an evil cheerleader of the mustache-twirling variety), and it has a subtle but sweet message about forgiveness and learning from past mistakes. This is told in dual narratives – one Riley’s, focusing on prom and her crush on Owen, and the other Catherine’s, focusing on her struggles to break free of her mother’s iron grip – and that actually works to its benefit, which is unusual, as contrasting voices usually just make a story harder to follow. More on that later. This book’s greatest strength, as with any good rom-com, is its humor. Riley and co.’s bumbling adventures in prom-planning were often times uproarious – everything that can conceivably go wrong does in absolutely hilarious fashion (in that, it sort of reminds me of Save the Date, which I also reviewed). I was in stitches by the end, when *SPOILER* half of the cast ends up in a spectacular round of fisticuffs on the dance floor at prom, sets the venue on fire, and is collectively arrested *SPOILER*. That was what made this so enjoyable to read – bad things happening to likable people is funnier here than perhaps it should be. As I mentioned before, “Prom-Wrecked” follows two stories, Catherine’s and Riley’s; Riley’s is far and away the more humorous, honing in on prom mishaps rather than melodrama. I want to focus here on Catherine’s, because, although it is more serious, it’s extremely sweet. Her story focuses more on emotional struggles than Riley’s does, but by the end of her narrative, Catherine has found the courage to stand up to her controlling mother and admit her mistakes in order to repair a long-broken friendship, sending a genuinely sweet message about honesty and forgiveness. It’s got mildly salty content, but even for that, “Prom-Wrecked” is…well, pure. Its messages and themes are incredibly wholesome, though its characters act as realistic teens would (not always for the best). And although it isn’t particularly profound, “Prom-Wrecked” will leave you with a warmer heart than you went in with. Recommended For: anyone looking for a light, fun, amusing read – perhaps to pass a few hours on a plane or long drive? Avoid If: you would rather read a book with something incredibly profound to say about life, society, etc. Possibly-Objectionable Content: scattered vulgar language, a few detailed kisses, underage drinking, and about two allusions to adult situations. Riley will have an unforgettable teenage experience, damn it, if it’s the last thing she does. First off: Thank you to Net Galley for providing me with this ebook in exchange for my honest review! I really enjoyed this book. Honestly, way more than I thought I would. It was fun and sweet and had all of the senior year nostalgia. Both Riley and Catherine were great characters to have narrate the book. They were parts in each character that I think most people will be able to relate to. I also appreciated that they were not pitted against each other as enemies. The romantic plot lines were a good portion of this book but not the focus. Instead you got to watch Riley and Catherine grow into themselves. There was even a little twist at the end that I did not see coming. There were also a lot of funny hints and jokes to what would eventually happen on prom night. I wanted more interactions between Riley and Catherine. I would have liked to see more of their friendship being rekindled. All the other relationships had a lot of page time but theirs and it was a little disappointing. I was definitely #TeamRileyandCatherine the whole book. Overall, this was a fun read that would definitely make a great Netflix movie (hint hint Netflix). *I received an arc of this book from entangled publishing via netgalley in exchange for an honest review. Okay. Books told in alternating point of views tend to be confusing but this one actually flowed pretty well. I appreciate the fact that there weren't any time jumps and just continued on from the previous chapter. This book was SO GOOD i could not put it down. This book was full of humor, especially when it came to the chapters narrated by Riley. The other chapters were narrated by Catherine *I received an arc of this book from entangled publishing via netgalley in exchange for an honest review. This book was full of humor, especially when it came to the chapters narrated by Riley. The other chapters were narrated by Catherine, Riley's former best friend. While Riley's narration tended to be more on the humorous side, Catherine's tended to be more serious and real. Catherine's struggles with being herself around her mom is something I'm sure many people have gone through but the character development was honestly one of my favorite parts. The only thing I didn't like isn't necessarily about the story but the transition between scenes. I hope it gets fixed in the final publication but it was very confusing. The premise of this was really fascinating and the book lives up to it. The book was told in Riley's point of view and her ex-BFF Catherine's, which I did not expect but I liked that it shows both their points of view on everything. Different POV's can be quite confusing if the characters and their voices aren't developed well enough but for me, each of them had a distinct voice and the different POV's gave readers insight on what each charact I was given an ARC in exchange for an honest review. The book was told in Riley's point of view and her ex-BFF Catherine's, which I did not expect but I liked that it shows both their points of view on everything. Different POV's can be quite confusing if the characters and their voices aren't developed well enough but for me, each of them had a distinct voice and the different POV's gave readers insight on what each character was thinking. I really liked that this book had humorous dialogue but some more serious and real stuff as well. Catherine's struggle to find her identity is something I'm sure a lot of people can relate to and empathize with. I would definitely recommend this for people who enjoy a YA book with developed and developing characters trying to find their path in life. I want to thank Netgalley for providing me an Arc of this book in exchange for my honest review. I laughed so much reading this book it was honestly amazing. I got invested in all of the characters and felt their pain when everything just kept going completely wrong. Riley is an amazing main character and I love her story and character development. The plot was amazing I was on the edge of my seat wanting to know what was going to happen next. It was hilarious without being ridi I want to thank Netgalley for providing me an Arc of this book in exchange for my honest review. It was hilarious without being ridiculous and I think that’s what I loved the most about it. I voluntarily read and reviewed an advanced copy of this book. All thoughts and opinions are my own. I received this book via netgalley. What started as a plan to save the school's prom, ended with a night in jail. When prom seems to get cancelled, Riley steps up and takes on the role of prom committee leader. With the help of her classmates she tries to save prom, but she could not foresee all the obstacles that come in their way. Yet, Riley is determined to make prom happen. I requested this b I voluntarily read and reviewed an advanced copy of this book. All thoughts and opinions are my own. I received this book via netgalley. I requested this book from netgalley because I was in the mood for a light and quick read, that is exactly what I got. This is not the type of book I normally read but I have to say I really enjoyed it. It had the perfect mix of comedy and drama, that made it feel like a good romcom movie. The writing was not remarkable, but the story didn't need that. The story was carried by the plot and characters and those aspects were good enough that I didn't mind the writing. I think the story is a lot of fun, I constantly wanted to keep reading to see what would happen next. The strongest point of the story was the comedy. When I thought things couldn't become worse the story went there and did so in a hilarious way. I actually laughed out loud a couple times when reading this book. Even though you wouldn't think so from the synopsis, the story follows two perspectives. The perspectives of Riley and Catherine. I appreciated the dual perspective and I think it was necessary to prevent Catherine's character from becoming one dimensional. However, there were moments near the ending of the book where I was a little bit confused sometimes about whose perspective I was reading from. I also found the pacing to be a bit strange near the ending. From the prologue I knew that a lot of things still had to happen, but there were very little pages left which made me worry that the ending would be rushed. Unfortunately I found that to be the case. The final actions happened a bit too fast for my liking and I would have liked them to be fleshed out a bit more. Overall, I really enjoyed the story and I am glad that I decided to pick it up. The story did have some flaws, but not major enough to really affect my enjoyment of the book. I would certainly recommend this book if you are a fan of funny, laugh-out-loud, romcom type reads. Their prom night ended with forty of their classmates in jail. But that wasn’t even the worst part. I requested this book from Netgalley for an easy read. It totally was! It was something I could put down and pick back up later, knowing exactly where I’d left off. I loved the front cover and description too. We follow two main characters, Riley and Catherine, who used to be friends in 8th grade but have since drifted apart. Soon they both find themselves on the prom committee, working together to Their prom night ended with forty of their classmates in jail. But that wasn’t even the worst part. We follow two main characters, Riley and Catherine, who used to be friends in 8th grade but have since drifted apart. Soon they both find themselves on the prom committee, working together to throw a night to remember for their classmates. I liked both of these characters - Riley was fun and enjoyable to read about, whereas Catherine was a bit more difficult to appreciate at first, although she had the biggest character arc and by the end I was enjoying her POV more than Riley. There was a bit of a weak moment in the middle but once I got last a few chapters it picked up again and was a fun and enjoyable read. Recommended to YA readers who want something more realistic! T.H. Hernandez is a published author of young adult novels. THE UNION, a futuristic dystopian adventure, was a finalist in the 2015 San Diego book awards in the Young Adult Fiction category. SUPERHERO HIGH, an urban scifi teenage romance, set in San Diego. Her first young adult contemporary co-written with Jennifer DiGiovanni, PROM-WRECKED, releases May 6, 2019. She thrives on coffee of any kind, t T.H. Hernandez is a published author of young adult novels. THE UNION, a futuristic dystopian adventure, was a finalist in the 2015 San Diego book awards in the Young Adult Fiction category. SUPERHERO HIGH, an urban scifi teenage romance, set in San Diego. 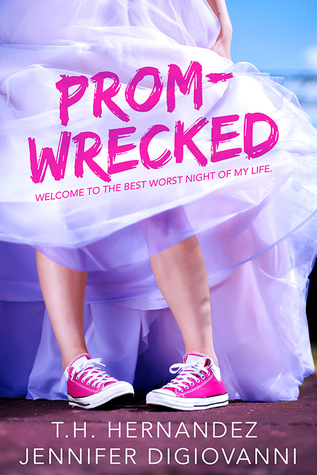 Her first young adult contemporary co-written with Jennifer DiGiovanni, PROM-WRECKED, releases May 6, 2019. She thrives on coffee of any kind, though pumpkin spice lattes are her favorite. Her free time is spent hiking, reading, painting, and binge-watching Game of Thrones and Stranger Things. She adores Star Wars, Comic-Con, Doctor Who, Bad Lip Reading videos, and all things young adult, especially the three young adults who share her home. When She's not visiting the imaginary worlds inside her head, you can find her in usually sunny San Diego, California with her husband, three teenagers, who are far too tall to be considered children, a bearded dragon, a couple of cats, and a dog who thinks he's a cat, lovingly referred to as the puppycat.